When it came to making decisions on window treatments for my the two bedrooms, I knew that I wanted the kind of window shades I grew up with in the 50s and 60s. The kind of shade we see in old black and white movies. The kind of shade your grandparents had. The kind of shade that feels like overly starched cotton. The kind of shade that wrinkles like paper and yellows in a funky way as it ages. Three years ago, after gobs of google searches, the only site that offered exactly what I wanted was The Handwerk Shade Shop. My six shades were custom-made at that time, so I don’t know if they are still taking orders. And today, just before typing this post, I did another google search and came up with the same results—pretty much nothing. There are plenty of the vinyl or plastic types, but nothing like what I have. Perhaps interior designers have their own secret sources which I’m not privy to. In my opinion these shades are perfect for an old house like mine. During the day, I keep these shades uniformly pulled down to the first top muntin bar (also called the glazing or sash bar). I had noticed that in old movies the shades were always pulled to line up with a muntin. 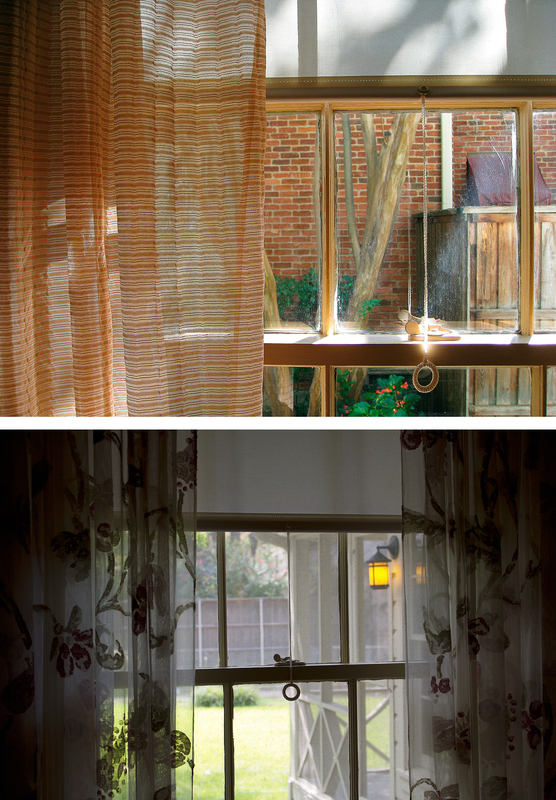 From the outside, my house’s windows give the impression of having sleepy eyes, since the front living and dining room windows’ roman shades are also pulled down to that first muntin. If any of you out there, know of a source for this kind of shade, please leave the names and links in the comment section of this post, and I will include them in my future resource guide. Thanks.